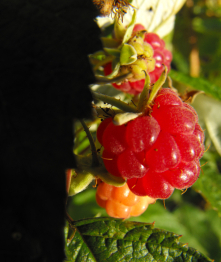 We like to prune our everbearing raspberries so that they produce both a summer and a fall crop, which is a bit trickier than the conventional method of mowing the plants all the way down in the winter and getting one big fall crop. 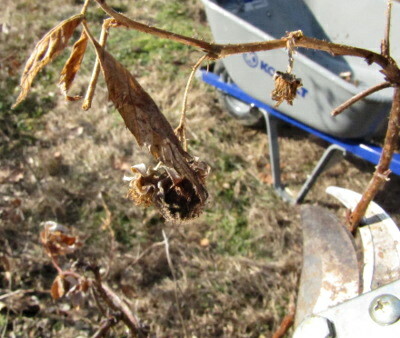 If you're looking for a double harvest, you still prune in the winter, but have to be a bit more specific about what you cut off. The first step is to remove all of the dead canes. 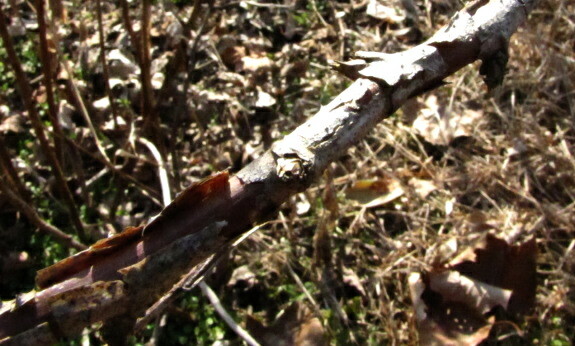 These are the canes that fruited last spring, and they're pretty easy to pick out since they've turned brown and their bark is peeling, like the cane in the first photo. 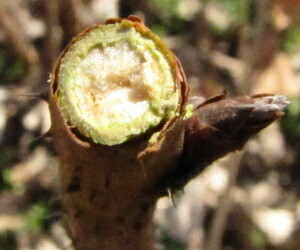 Next, you want to cut the tops off the canes that fruited in the fall. Most people admonish you to cut off the top third, but the truth is that you're cutting off the dead part. After snipping off a few tops, you'll start getting an eye for guessing the point at which the plump, live cane turns into the more shriveled, dead cane. To check your work, look down at the cut end --- you should see a thin ring of green, showing that you've cut all the way down to the living tissue. If you wanted, you could stop pruning here, but thinning out some of the living canes will give you bigger, healthier berries in the spring. The rule of thumb is to leave four or five of the thickest canes per linear foot of row. 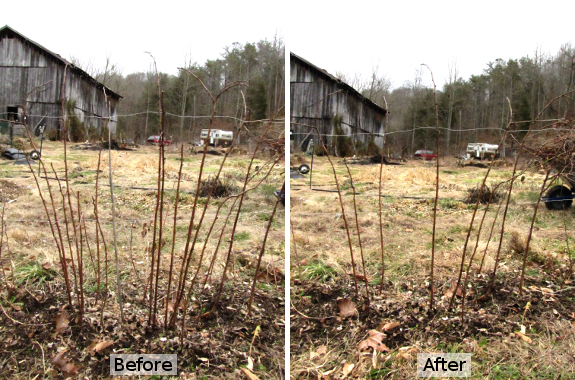 The photo above is a before and after shot of this last step in pruning our raspberry patch. Now throw down some compost and a thick layer of mulch and wait for the sweet, juicy berries in June!